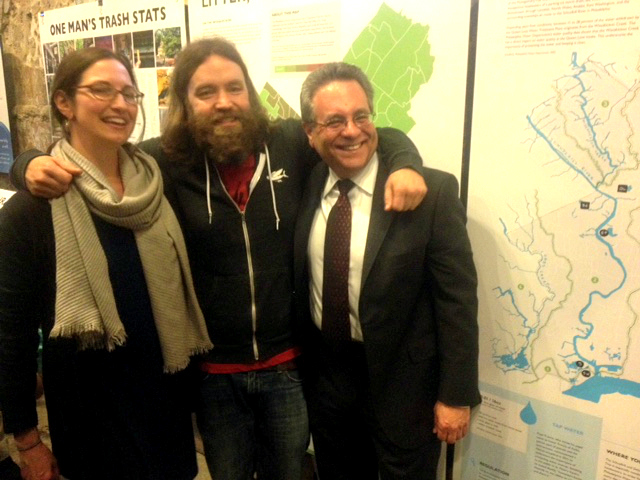 What a Chocolate Cake Model of Fairmount Park can teach us about how people use public space. Nyla: What’s your relationship with Fairmount Park, Alex? Alex: Personally, I use the park almost every day to relax, to swim, to exercise. I live almost next to it. When and how did the idea for a chocolate cake map come about? We did this for the first time in 2009 in Austin, Texas. In that case, it was a clear response to lackluster community engagement for a proposed project. We wanted people to get truly involved, and we asked, “How do you get people to stop, talk, and share their ideas?” Everyone loves chocolate cake, so it’s pretty easy to get people to participate. With chocolate cake in the form of a place, people can’t help but stop and have a conversation about it. When you’re icing a great big cake, it’s pretty hard to be frustrated or bored. It can be challenging to locate all the destinations and access points in a 2,000 acre park and it requires tapping into things they maybe didn’t know. The first rule of chocolate cake engagement is — you can’t have a piece of chocolate cake until you share an idea! Fairmount Park is a pretty amazing place and a unique gem for Philadelphia. Public Workshop’s goal was to help people explore their experience of the park as they are building it in miniature. Being one of the largest inner city parks in the country, people have very different experiences with its varied amenities and sections. This is an important way to understand it – by building it as a replica. It’s how we started off learning about the world as kids too. We all started learning about the world the same way, whether we were black or white or rich or poor. And so it’s a way to have conversations about a place, to explore it, to meet new people in the process, and create something that everyone is proud of, and have a deeper conversation about something that is pretty hard to fathom in its 2,000-acre entirety. 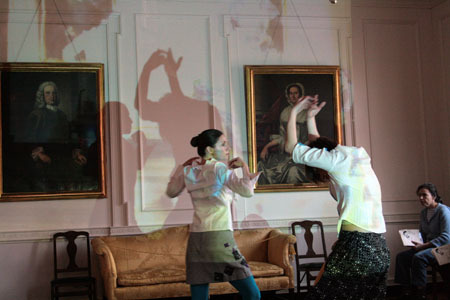 What was the most gratifying part of Sunday’s activity? There were a few moments: The first would be how everyone leapt into creating the Schuylkill River. Everyone had fun pounding down the water course and carving the riverbed. It started a conversation about the Park’s significant topography and most people don’t realize how much the River actually bends. Also, seeing people put stuff in the wrong place and then have to have conversations like, “the Please Touch Museum is not there,” and “oh, that isn’t Mander Recreation Center.” “Did you know Mander Rec center has a pool?” There are so many assets in the Park that even relative experts struggle to accurately locate everything. My third favorite moment was just as we were getting ready to cut the cake – it allowed an opportunity to talk about the fact that there used to be a park trolley. And, it was great to see how excited everyone was when we started talking about that briefly. The fourth favorite moment was when we had participants map their experiences in the Park and I distinctly remember being struck by one person having their first date with their future husband at the whispering benches and another woman passionately talking about the joy of looking at the moon from Belmont Plateau. Lastly, when we still had cake left to give away, a bunch of new people stopped by and talked with our group. They got excited talking about their experiences with the park; learning new aspects of it; and were floored to have their pictures in the Fairmount Launch, with historic images of the Park in the background–this lead to numerous other conversations as well. Then there were people from out of town who came up and for them to see a bunch of us be so excited about the park and see this great model, it was fantastic! 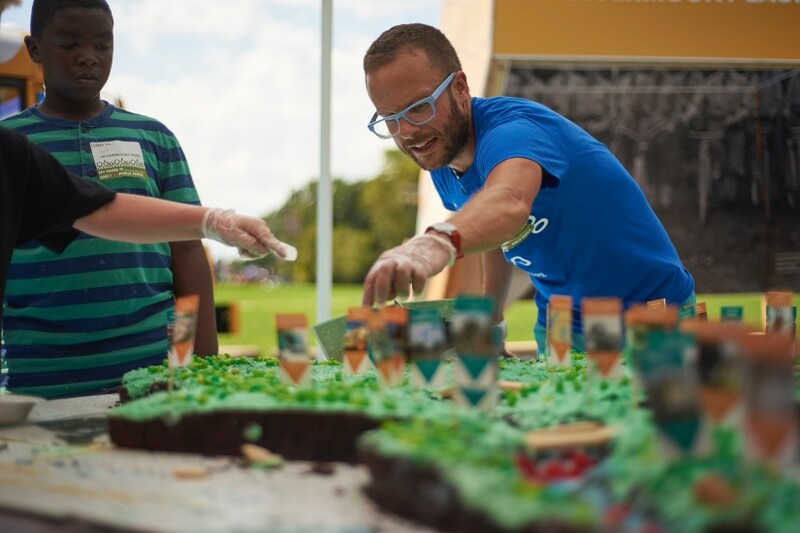 For the people who hadn’t participated in the cake building, it was easy to get them involved and sharing not just because it was chocolate cake but because it was a massive chocolate cake model of a park. We probably had about 95% of the people who were at the OVAL, that day come by and participate in some way. Given the heat advisory that day, that was a huge success and particularly cool! To see photos from this fun day, click here. 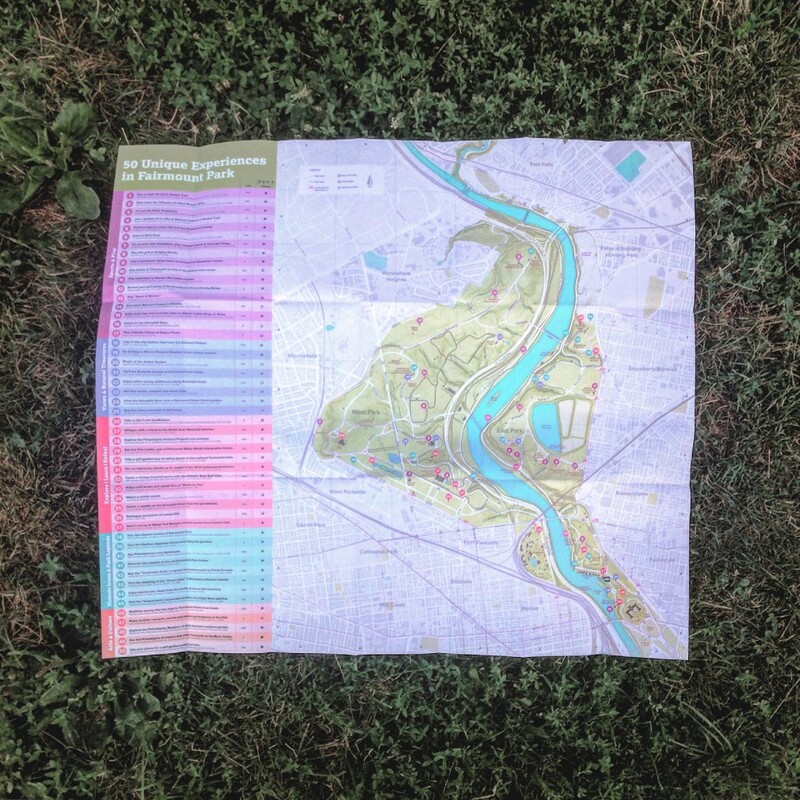 You can finally have your very own map of Fairmount Park!